We left Uoleva early in the morning and arrived in Nomuka Iki around 1500 hours. As we approached the pass between the main island, Nomuka, and Nomuka Iki there is a mother humpback and her baby playing near the shore. It never gets old watching these amazing and beautiful creatures perform their water ballet. We only stop here for a short rest on our way to Nuku’Alofa but seeing it now I wish we could stay longer. The beach is absolutely beautiful and the water….crystal clear. Nomuka Iki used to house a prison but now is uninhabited. SV Begonia, a catamaran, is in the anchorage and SV Nala Danica arrived just behind us. They too only plan to stay just a short time as well. We are both trying to get out before the big blow that’s going to bring 20+ knot winds on the nose. The sail from here to Nuku’Alofa is just an overnight sail of around 60 NM so we plan to leave after dinner. The winds are already beginning to pick up but unfortunately they will be right on our tail tonight. Dazzler doesn’t do well dead down wind (DDW) so we will likely be motoring the whole way. Just in case, we take off the sail cover and prepare to throw up the main. Captain’s order are Captain’s orders so I head below and hit the bunk. It seems like only minutes before the “gallows man” shows up to roust me from my slumber. I make my normal grumbling noises but climb out of the bunk and start getting dressed for deck duty. Dan says it’s not all that warm out so I throw on some pants and a long sleeve shirt. He gives me the lowdown on what’s happening then kisses me goodnight as he heads forward for some much deserved rest. I do my normal routine. Get dressed, don my life vest, make my Coca Cola and grab a snack. Usually it’s homemade granola bars but we’re out and I’ve been too lazy to make them. Tonight Grape Ape and I are having chocolate chip cookies! Dan calls them biscotti. I grab my iPad, snack and soda and head to the cockpit with Grape Ape. It’s a little roly out here tonight but not too bad. The lightening has pretty much stopped but Dan told me if it starts up again and appears to be getting closer to wake him up. For now, I check the instruments, do a visual check of the boat and then I open my iPad to do a bit of reading. Around 0100 the lightening starts to kick up again. Initially it’s coming out of the southeast but soon starts moving to the southwest and now there are bolts from time to time. I start counting the seconds between the strikes and it appears they are getting closer. Damn! I hate waking him up but it’s what has to be done so down I go. “Honey, we’ve got lightening and it appears to be getting closer. You want to come up?” I query as I gently pat his leg. He grumbles a bit but up he comes. You know what it’s like when you have a funny noise in your car for weeks and the moment you take it to the mechanic it disappears? Well, that’s exactly what happened to me. Almost the moment Dan steps on deck the lightening seems to start to dissipate and he’s looking at me like I’m out of my mind. But, he’s so kind and sweet. He says it looks like it’s okay now and kisses me before heading back to bed. I love how patient he is with me out here. Now that he’s decided all is good I’m feeling a bit more relaxed. Of course there is a large container ship headed almost directly at us but I’m confident they will alter course to avoid collision and while it is always a bit unsettling at night, they do as expected. They pass on our starboard side about 2.25 NM away. All is well now and I’m enjoying my watch, the brightly lit stars and the cooler temperatures. We have a watch commander alarm that goes off every 20 minutes. It’s a safeguard we use when we are on passage. At first it is this rather annoying beeping sound but if you don’t reset it after about 30 seconds it becomes a very loud, high decibel alarm. This is to notify the rest of the crew that whoever is on watch isn’t responding to the alarm. It’s not something you want to hear if you are down below as it instantly brings with it a bit of panic wondering where the person on deck is when the alarm sounds. It’s happened to each of us more than once. Usually it happens when you’ve gone below to use the head. It always seems to go off the minute you have your drawers below your knees. HA HA. I can’t count the number of times I’ve gone racing from the head to the nav station with my britches at my ankles just trying to keep the loud alarm from sounding and waking Dan. Yes, it can be annoying but we use it and I’m glad we do. Just before 0300 the watch commander goes off. When it does I do my normal check around deck and I take a look at the instruments. When I look at the radar I see a large storm cell headed our way. There’s no lighting so I assume it’s just a typical South Pacific squall. You know? The Captain Ron…they come on ya fast and leave ya fast type of thing. This one looks pretty large so I figure I’m going to get wet. I head below to grab my foulies. I don’t want to take shelter under the dodger because I want to know what is happening. The blowing rain lasts for about 40 minutes and I stay and the helm the entire time because the wind keeps going from one side to the other. Finally I see some clearing skies and stars ahead. The rain starts to subside and the winds drop back from their high of 22 knots back down to 9 or 10 knots. I spend the next 20 minutes drying the cockpit so Dan doesn’t have to come up to a soaking wet mess when he comes on watch at 0400. I’m just settling back in when Dan starts stirring below. Once I hear him I head down to make coffee. It’s another one of those mornings when I’ll stay up because we are so near our port. I give him my account of my watch and he looks like he’s just happy it was me. Honestly I’d have given him the same look had he been the one on watch at the time. We arrive in Nuku’Alofa around 0900. 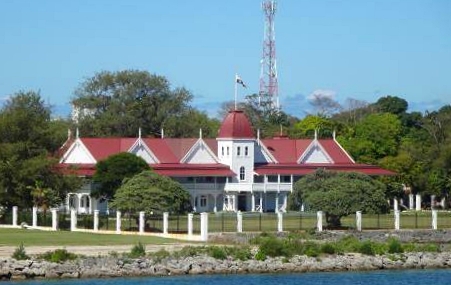 As we come near the main island we can see King Topou VI’s palace on the waterfront. The anchorage we will set down in is at the Pangaimotu. Big Mama’s Yacht Club is there and we’ve heard a lot about it. This is a bit over a mile from the main island of Nuku’Alofa but it’s where all the cruisers tend to go. It’s cloudy and pretty yucky out as we near the anchorage but just as we drop anchor the sun comes out and it’s a beautiful day. As we sit to have our anchor down beer we are looking across to Big Mama’s place and the sunken ferry that sits out front. After some rest we’ll probably head in for a bite to eat but for now we’re just going to enjoy the scenery and be thankful for yet another safe passage. We left Mounu in the wee morning hours to head to Lifuka in the Ha’apai Group of islands here in Tonga. We arrived late in the afternoon under the cover of clouds and mist. It’s not the ideal way to enter a new anchorage but we did get just enough light to be able to see the bommies under the surface. 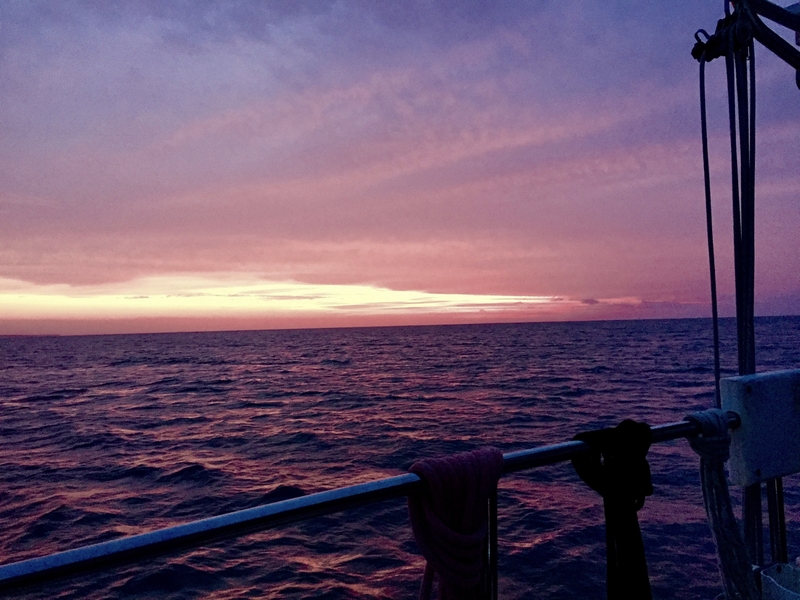 The following morning we headed to shore to do our official check in with the authorities. In Tonga you must check in with each island group even though you’ve officially checked into the country at your first port of call. Once on shore we start to seek out the appropriate office for checking in. This turned out to be a bit of a challenge. One person says “go here” and another says “go there”. Ironically enough we stopped at the police station and were told to go to the building next door. When we got there they told us the office had moved. How is it that on an island of less than 3000 people the police don’t know where the immigration office is located??? Well, it turns out that the office had just moved to their new location the day before so I guess we’ll give the officer a break. The key to handling the difficulties you experience in these third world countries is patience. We obviously wanted to get our check in done expeditiously but we also got a great tour of the village as we walked from place to place so we just tried to enjoy the adventure. Once we found the office we checked in and out at the same time. We didn’t plan to spend any time here in Lifuka as we are trying to work our way south to Nuku’alofa to prepare for our jump to New Zealand. After checking in it was time to find some grub. The sweet young man who checked us in needed to make a copy of our paperwork and since the office was not yet set up with a copy machine he had to go back to the other city offices. He offered to drive us there and then to wherever we wanted to go. Once the copy was made he dropped us off at a restaurant we’d heard of from the cruiser guides. We went to the Mariner’s Cafe. As with most of the little restaurants in the islands it’s not much to look at but it certainly has character. We sat at a table near the street and chatted for a bit. Across from us sat two Tongan men wearing their traditional Tongan garb that includes the taʻovala (woven mat that is worn around the waist). Before long we had struck up a conversation with them. Anyway, we had a wonderful conversation with Kenny & Davita. They gave us a gentle warning to be sure we keep everything locked up tightly in Nuku’Alofa as things disappear rather quickly there. We told them our plan is only to check out of the country, pick up some supplies and top off fuel so we won’t be there long. After they left we struck up a conversation with Tonu. His wife who is from Poland, owns the café. Their young son was there as well. He was another very interesting person to talk with about the area. He had a slightly different take on things but then he may have just been trying to downplay the criminal side because their business caters to tourists and cruisers. The following morning we headed back to shore for some quick provisioning before setting off to the next anchorage. There was a Tongan Navy ship in the harbor. They were pretty laid back and very friendly even allowing me to snap a couple of pics. A typical store in the islands. We made our way through town from store to store as always. You can never find one store that has everything you need. It’s like hunting and gathering in the islands. Once we had everything we wanted we headed back to the boat and hauled anchor. We motored for just about an hour and anchored down at Uoleva Island. John & Lynn of SV Danika were there and Dan knew John from Mexico. John left there a couple of years ago and has stayed in the South Pacific. On the way we saw three or four humpback whales playing. That is always such a treat. The anchorage here is truly beautiful and there’s actually a real sand beach…not crushed coral! That’s something to find down here as most beaches are not really sand. You actually can sink up to your mid calf in this soft, squishy sand. It’s quite a bit of exercise just getting from the shore up the beach. We only stayed here for two nights. The first evening we had dinner on shore at the Sea Change Eco Resort with Lynn & John. The food was excellent but the resort is rather odd, at least to us. It’s an eco-friendly resort. Everything is solar powered and there is no indoor plumbing. It’s like high dollar camping. Sailing is more my idea of high dollar camping! LOL! It’s definitely not the type of resort I want to pay to visit but I guess if you’re into that kind of thing this is supposed to be one of the nicest. One thing that is quite disturbing for us is the way the whale watching boats get so close to these animals. In Tonga, in particular, they sell these “swim with the whales” packages for tourists. In order to get the swimmer close to the whales they zoom up really close and then drop in the swimmer. What’s even further disturbing is the fact that the Sea Change Resort goes to great lengths to sell the fact that they have virtually zero carbon footprint and are all about the environment yet they have one of the largest swim with the whales businesses. So I guess if you are eco-friendly it’s okay to molest the whales? Yeah, this is not something that sits real well with us. Had we known this we likely would not have had dinner there. We spent two days at this little island and then decided it was time to move on. I think we’re both getting a bit antsy about getting to New Zealand. And the passage there is not for wimps. We’ve heard it can be a bit rough if you don’t get the window just right so we really want to get to Nuku’alofa and get provisioned up and ready to take the best weather window. We really wanted to see more of the Ha’apia Group but as usual Mother Nature had her own plans. It appeared that the best time to head towards the Tongatapu Group was about to be upon us so we decided we better reevaluate our plans. Dan began studying the weather and reviewing the charts as I prepared the cabin for our next passage.